Apple has just quietly added an "Apple Events" channel to the Apple TV. The channel will allow everyone with an Apple TV to livestream today's iPad mini event. Selecting the channel shows a message telling viewers to tune in at 10AM PT to view the event live. 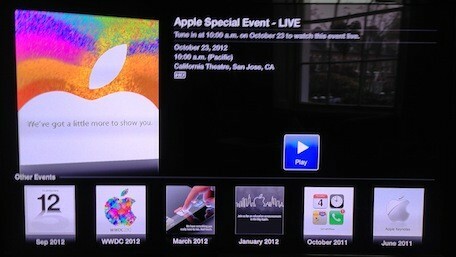 The channel also allows viewers to stream past Apple events right to their Apple TV. Update: Apple will also stream the event live on the web. You can watch the stream on Apple's website.